This past week I fly above Arizona State Route 143 heading eastbound out of Sky Harbor International Airport. 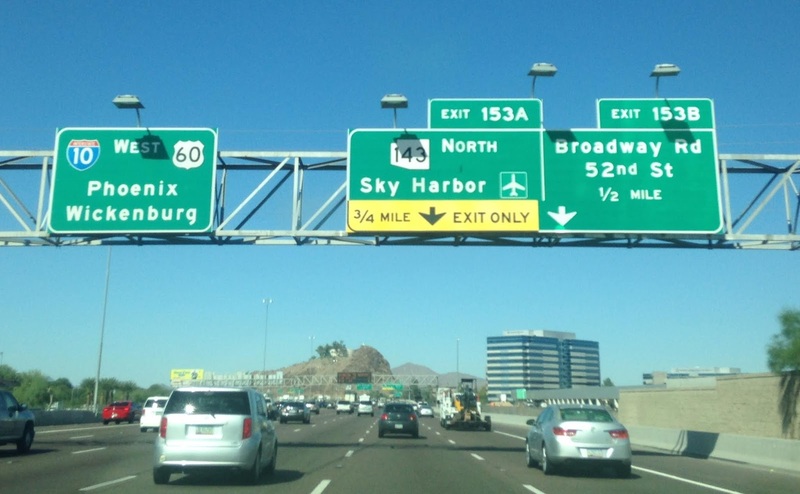 AZ 143 is a freeway I frequented while living in the Phoenix area between 2001 to 2013. AZ 143 is a short approximately 4 mile Freeway from 48th Street/Interstate 10 north over the Salt River to AZ 202/McDowell Road. 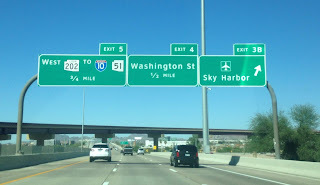 AZ 143 serves essentially as a connector freeway between I-10, AZ 202 and the east entrance of Sky Harbor International Airport. AZ 143 is known as the Hohokam Expressway. The legislative history of AZ 143 dates back to the late 1950s when the route was planned as a connector to the planned freeways in Phoenix. 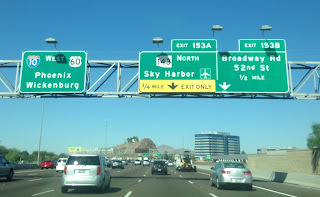 AZ 143 opened to traffic in 1978 as a parkway which essentially the 40th Street entrance to Sky Harbor which was subsequently dismantled to make way for present terminal complex. During the 1990s AZ 143 was converted to a freeway grade and recently had the interchange with AZ 202 replaced as of 2011. AZ 143 in present configuration has only a partial ramp freeway-to-freeway interchange with I-10. At present moment only I-10 east to AZ 143 north has an at-grade interchange while all other travel directions have freeway ramps. Surface traffic on AZ 143 southbound becomes 48th Street. The photo below is of I-10 westbound approaching AZ 143 northbound. Northbound AZ 143 continues briefly beyond AZ 202 where it terminates at-grade at McDowell Road. This northbound guide sign shows exits; 3B for Sky Harbor, exit 4 for Washington Street and Exit 5 for AZ 202.